Well, believe it or not, these compact, old-world tech devices do have some specific uses. 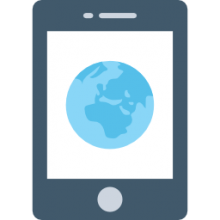 In particular- they can be used offline, are great for the elderly who might not use smartphones, and are useful when you traveling abroad without smartphone service. Our top pick is the Collins English Dictionary & Thesaurus- it features a 500,000 Synonym Thesaurus and a dictionary with 118,000 words. While the Franklin Collins Pocket Speller has received a lot of praise- it is more of a 'speller' than a pocket dictionary tool. An electronic dictionary is a portable machine that stores information in electronic form and allows you to look up word definitions and spelling quickly without having to carry heavy books. Most newer electronic dictionaries also include a thesaurus (Source). Most modern electronic dictionaries feature a LCD screen and a keyboard for input. Users will type in the word they’re looking for and the system will find the definition and correct spelling if needed. Some dictionaries even feature a basic encyclopedia, which can be useful for looking up information without an Internet connection. While the laptop and the smartphone have all but rendered the electronic dictionary obsolete, they’re still very useful for young children and older adults who need something durable and simple to use. Buyers suggest getting a device that’s portable and one that’s upgradable to include other languages (Source). We took a look at 5 popular electronic dictionaries that should be useful and meet your needs whether you’re looking for something to help with a homework assignment or help with a crossword puzzle. The first up is the Franklin MWD-1440 Dictionary / Thesaurus, which is an electronic dictionary that features a 100,000 word dictionary and a 50,000 word thesaurus. Bookman support means you can add additional cards to expand the system’s references capabilities. Users who bought this device like the portability, saying it can fit in a pocket, versus having to lug heavy books around. Next up is the Seiko Er6700 Concise Oxford Dictionary / Thesaurus & Encyclopedia, which enables you to search at high speed over 240,000 words, phrases, spellings and subjects. This device features a built-in encyclopedia, which gives you access to over 12,000 entries and the system will even help you finish nagging crossword puzzles. Very compact and will fit easily into a travel bag or backpack. Users say it’s very powerful for the size. The Franklin MWD-460A Merriam Webster Dictionary and Thesaurus features a dictionary with over 274,000 words. The 4-line LCD display features an adjustable font size, which the other units don’t have and makes reading easier if your eyesight isn’t what it used to be. Overall, the unit is approximately 3x5 and very portable. Perfect for kids or for those who don’t have access to a smartphone or computer. The Collins English Dictionary with Thesaurus Express edition, like the others, is a very compact unit that will be good for travelers and young school students. While buyers liked the system’s ease of use, some thought the lack of a backlight for the LCD screen made viewing difficult. 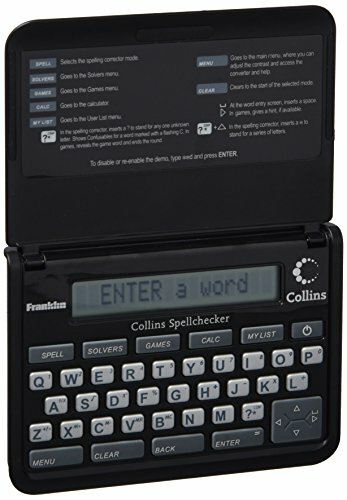 If you’re looking for a top-rated electronic dictionary, you might want to consider the Franklin- Spq109 Collins pocket speller. Users love the usefulness of this device, but do complain about the small keys. This device is an electronic Collins dictionary of spelling and hyphenation. It has many useful features, such as phonetic spell-correction, confusables, word builder, crossword solver, anagram solver, calculator, metric and currency converter, and 6 games. This item might be a good choice if you want to build your vocabulary and spelling skills in a fun way. In general, buyers have a very favorable opinion of theFranklin-Spq109 Collins electronic dictionary. They agree that it works great and gives answers fast. Users conclude that it is very useful and efficient. However, purchasers do complain that the keys are small. 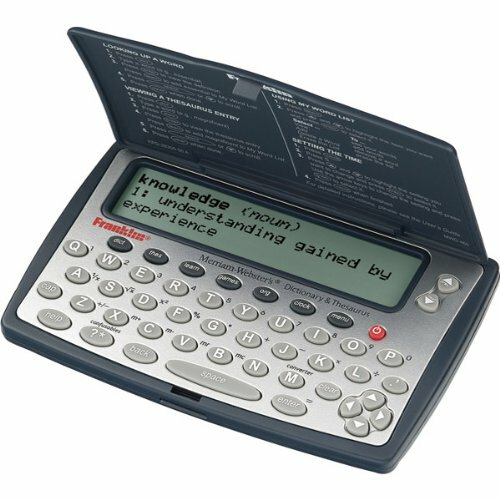 If you are looking for an electronic dictionary, you might want to consider the Franklin Collins English Dictionary (DMQ-221). Users like the practicality of this electronic dictionary, but some do complain about its size. According to the manufacturer, this product contains over 118,000 words, phrases, and definitions from the Collins Express Dictionary. It features a 500,000 Synonym Thesaurus and phonetic spell-correction, confusables, anagram solver, word builder, 6 word games, and data bank with world clock. This item could be a solid choice for improving your spelling and vocabulary. The general user consensus regarding the Franklin Collins Dictionary with Thesaurus Express Edition is that it meets their expectations. Users agree that it is a useful and compact electronic device for improving your language skills. However, some buyers complain that it is too small. One online reviewer complains about the lack of backlighting in LCD display. Another complaint regards the short and loose hinge. The Franklin MWD-460A Merriam-Webster Dictionary and Thesaurus could be a solid option if you don’t want to lug around heavy dictionaries. Users love the compactness of this electronic dictionary, but some complain that it is not good enough for an adult. This product, it is claimed, gives you immediate access to over 80,000 words, 274,000 definitions with phonetic spell correction and over 500,000 synonyms and antonyms. 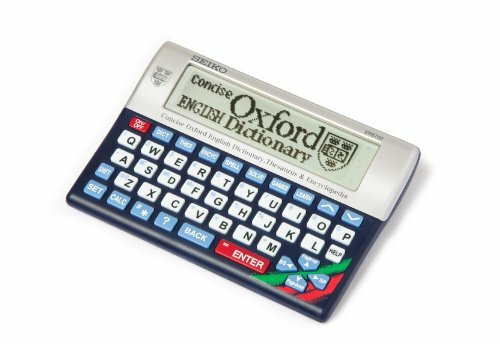 As the manufacturer boasts, this electronic dictionary also features a spelling corrector, SAT word list, and 9 interactive word learning exercises and games. Other useful features include confusables function, which distinguishes commonly confused words, as well as compiling your favorite words into customized lists. This item might be a solid choice for individuals who want a lightweight and compact dictionary. The general user consensus concerning the Franklin MWD-460A Merriam-Webster electronic dictionary is that it works well and is very handy. Purchasers appreciate that it is compact. However, some buyers find the top hard and frustrating to open. Some online reviewers complain that this device might do well for a 6th through 9th grader, but that it is definitely not good enough for an adult. The Seiko- Er6700 Oxford Dictionary/Thesaurus is a solid option for those who want a model with a comparatively large display. Users like the comprehensiveness of this electronic dictionary, but some complain that the batteries don’t last long. This product features the Concise Oxford Dictionary with a high-speed search of over 240,000 words, phrases and definitions covering current and historical English, as well as many specialist and technical subjects. It also includes the Concise Oxford Thesaurus with a search of over 4 million synonym links, as well as an encyclopedia with instant access to over 12,000 clear and concise entries. 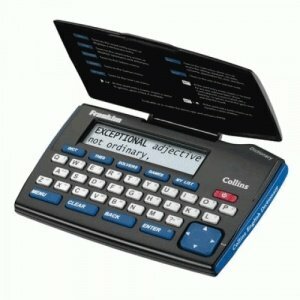 This product might be a solid option if you are looking for a two in one compact and easy-to-use electronic dictionary. The general user consensus concerning the SeikoEr6700 Oxford Dictionary/Thesaurus/Encyclopedia is that it is very comprehensive in its offerings and easy to use. They appreciate that it has a large screen, and find it to be a very handy device. However, many buyers complain that it drains batteries. As one user shares, he replaced the batteries 3 times over the course of 5 weeks of use. The Franklin Dictionary and Thesaurus with Bookman II is a solid option for someone who wants a lightweight and convenient word tool that can be carried around in a pocket. Users like the usefulness of this handheld dictionary, but some wish the buttons were bigger. This product is said to contain over 100,000 definitions and 500,000 Thesaurus links. According to the manufacturer, it supports Bookman II book-card system. This item seems like a solid choice if you want a compact, electronic version of the world-famous dictionary and thesaurus. The general user consensus concerning the Franklin MWD-1440 electronic dictionary is that it meets their expectations. Users agree that it is compact enough to be carried everywhere in your pocket and find it to be very useful and helpful. However, some buyers wish the buttons were bigger. Several disappointed online reviewers complain of receiving a malfunctioning item. Majority of the early electronic dictionaries was print dictionaries that were also converted to digital form: they had the same content as the print dictionaries; the only difference was that with the electronic versions users had an opportunity of better search. But with time the opportunities that digital media offered, started to be exploited. Space limitations were no more challenging, and additional content could already be provided; and there was the possibility of including audio pronunciations or video clips. Databases of such dictionaries are often very extensive, containing over 500,000 definitions and headwords, verb conjugation tables, a section of grammar reference, etc. Bilingual electronic dictionaries as well as monolingual ones of inflected languages very often have a tool for interactive verb conjugation and can stem and lemmatize words. Publishers and developers of these dictionaries can offer content from different sources: they can use content written by their own lexicographers, or they can offer licensed data from print publications. In some cases, they can offer both, as does Babylon. It offers premium content from Merriam Webster. Another example is Paragon Software which offers additional premium content from Duden, Harrap, Britannica, Oxford, and Merriam-Webster. Along with Latin script, all these dictionaries are available in right-to-left and logographic scripts, including Persian, Arabic, Chinese, Greek, Devanagari, Hebrew, Japanese, Thai, Korean and Cyrillic. When searching for a multi-lingual translator, or a monolingual traditional dictionary, you need to understand which features are the most important in an electronic dictionary. You also need to spend time on researching all the available options to be able to do a successful purchase. With the tips presented in this guide, the ones seeking to purchase such dictionaries can do so confidently, no matter the item is purchased from a physical retail location, at an online auction website, or on an e-commerce website. Buyers will understand that a little research plays a great role when making a purchase, and in this way they will be searching words, translating terms, or finding stronger words in a very fast way with the thesaurus features of a new electronic dictionary.